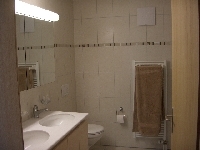 This highly acclaimed, spacious, middle floor, 3 bedroom apartment is comfortable with a generous 110 sq m of living space. 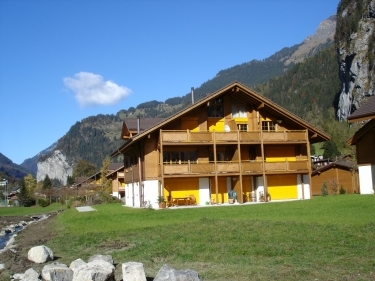 It offers an opportunity to holiday in the famous Lauterbrunnen valley of 72 waterfalls. 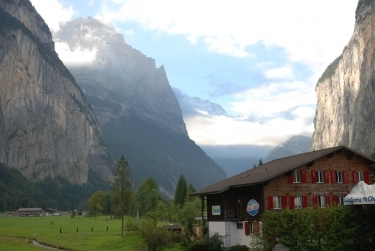 Getting to Lauterbrunnen either by train or car is very easy. Whether your choice is Summer or Winter you can be sure of lots to do, or just relax with the fantastic views from our balcony. It is fitted out to a high standard for discerning people. The living area captures the view of the snow capped mountains and has a full width SOUTH facing balcony for sun bathing or eating outside. The master bedroom has a sloping pine ceiling and looks to the Staubbach waterfall as do both other bedrooms and kitchen. A car is not essential but there is a garage. Free wireless broadband is available. The price also includes heating, cleaning, linen, local taxes and taxed rubbish bags ie. there are no extras. Please note that smoking is not allowed inside. We don't use bunk beds, sofa beds or shower curtains so your stay will be very comfortable. We don't use owner reviews adapted from our guest book and emails. All reviews are genuinely and independently written by guests. Please check the availability chart before sending an inquiry for your dates as we get booked up early. This chart is always kept up to date. Owners Profile: Rob has retired as Bursar at a large London school, so you can be sure that your money is safe and your contact with us will be efficiently and promptly handled. Susi is a native Swiss who speaks German and Swiss German fluently. 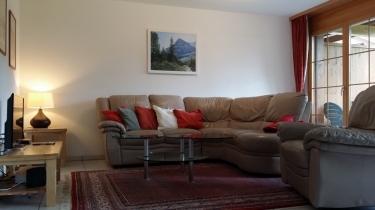 If you are a larger group we will try to find a second apartment for you through our contacts. If you want to sky dive, or take part in white water rafting at the time when the river is running wild, then Lauterbrunnen has all this to offer. 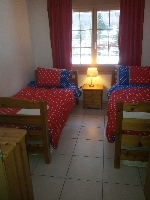 Our chalet is very convenient for skiing and walking and is only 1 minute from the bus stop for the 3 minute ride to access the mountain transport. Buses are free in the ski season. Alarm clocks in two bedrooms. FIRE SAFETY PROVIDED: Smoke alarm, fire extinguisher, fire blanket. NB These are not compulsory in Switzerland so for your safety please check if you're considering other apartments. Prices shown for up to 6 people. 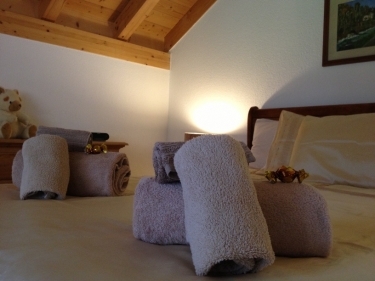 A 7th or 8th person can be accommodated for 80 Swiss Francs each.